The Belleville 763 Sabre Men's 6in Desert Tan Waterproof Hybrid Assault Boot was designed for military contractors and security professionals looking for a low profile, performance mid-height boot. This boot provides waterproof protection with a Gore Tex bootie integrated into the lining of the boot. It features a Vibram Ibex outsole with sharp angled lugs and defined heel maximize traction. 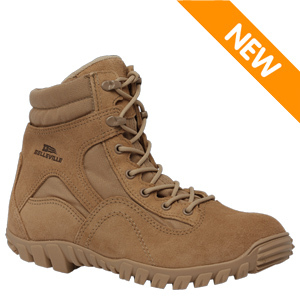 Ideal for temperate weather, this boot is ideal for vertical climbing & crawling. SIZING: Belleville Sabre Boots run the same size as your running or athletic shoe.